The KRPA Public Policy Committee (see below) is charged with oversight review of legislative action on both the state and national level. 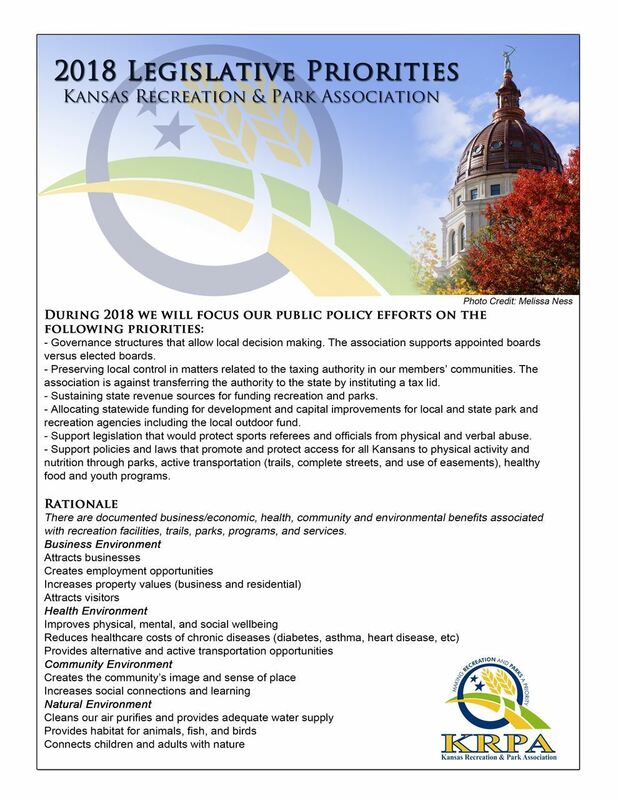 The committee recommends actions concerning legislative activities relevant to parks and recreation that are impactful to agencies in Kansas. At its core, advocacy is about engaging people in an issue or cause. As part of a public or nonprofit entity, it’s what you do every day. We know that parks and recreation would not exist without the support of the community. Every day that we’re encouraging people to enjoy our open spaces or participate in our recreational activities, we’re taking the first step in advocacy. So what is the issue or cause your department, commission or organization wants people to advocate for? Is there a particular policy keeping you from strengthening the work of your department or organization? Are you seeking additional public funding to support your work? In many cases, your immediate goal may simply be to develop an identified group of supporters you can call upon when an issue does arise and you need their help. Grassroots Advocacy: Informing the general public about an issue or cause and mobilizing them to apply pressure to those in a position to take action. Grasstops Advocacy: Engaging people with a high professional and/or public profile in support of your issue. These supporters can raise public attention or influence decision makers through their personal and professional connections. Direct Advocacy: Educating leaders about an issue in order to influence policies, procedures and/or funding.